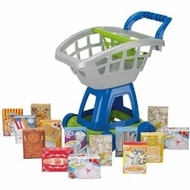 14 play food boxes, a flip-down doll seat, 4 oversized wheels and a huge basket for those big shopping trips. Shopping cart measurers 19" x 12" x 20-1/8". Measurers 19" x 12" x 20 1/8"